Dianthus gratianopolitanus growing herbaceous of the genus Dianthus also known as Cheddar pink, Dianthus gratianopolitanus perennial evergreen or as annual used as ornamental plant and also as cut flowers, can grow in temperate, subtropics or mediterranean climate and growing in hardiness zone of 4-10. Leaves color green-gray, the leaves elliptic shape. 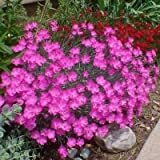 Flower color pink to white and all the variation between, the flowers have five petals with jagged edges. 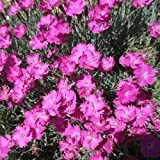 (25 Plants Classic Pint) Dianthus gratianopolitanus Firewitch - Cheddar Pinks Dianthus a Showy Profusion of Fragrant, Magenta Pink, 1" Blooms Cover The Foliage in Spring. 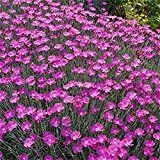 Pink to white and all the variation between, the flowers have five petals with jagged edges.